So you know I adore my smoothie bowls, and I eat them pretty often especially in the Spring and Summer. 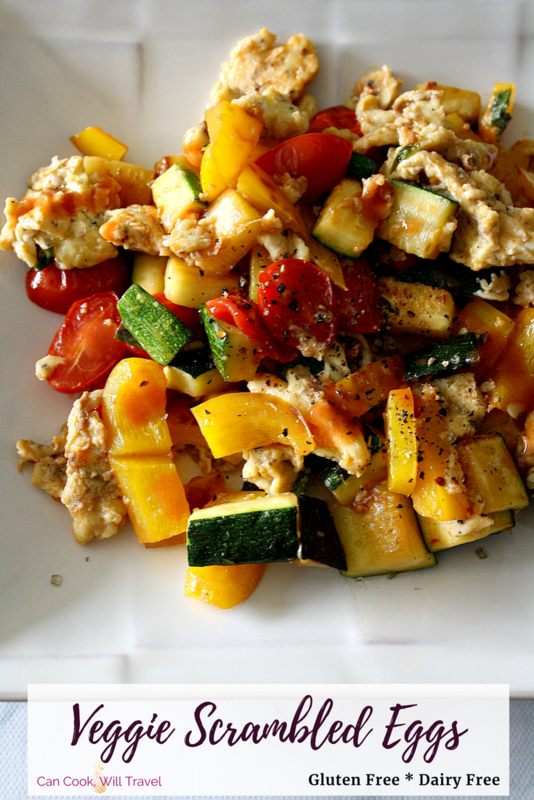 But I also have gotten into rotating this Veggie Scrambled Eggs breakfast into my weekly mix. And I realized that if it’s a recipe I love making, then I should definitely share it with you. I love breakfast, and never feel quite on my game without it. My morning usually starts with 2 big glasses of water, then lemon ginger water. Finally coffee and either a smoothie bowl or Veggie Scrambled Eggs enter the picture. If I’ve gone for a morning walk, then I’m usually warmed up and craving the smoothie bowl. But if I’m moving a little more slowly, I enjoy taking a few extra minutes to cook up Veggie Scrambled Eggs. However, this recipe is really fast and easy, so it won’t take long. I developed this recipe a few months ago when I started having a lot of veggies I needed to use up. Before I knew it, it was becoming a series regular on the breakfast menu. 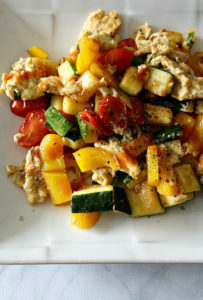 My veggie scramble starts with cooking zucchini and peppers until they’re starting to brown. That gets some major flavor going, and makes ALL the difference. Then I’ll add a few grape tomatoes for some tanginess. And since fresh basil covers my countertop, I like tearing up a leaf and letting it cook with the veggies. That basil is crazy good and takes the dish to another level. Once the veggies cook, then transfer them to a bowl and cook the eggs in the same pan. Now traditionally scrambled eggs cook over low heat in a cool pan, but I rarely have time for that. So instead, I remove the pan from the heat, wipe it out, add a little oil to it, and then get them started off the heat. Once they firm up a little, then I’ll move them back to a low heat, and finish cooking them. I like to add the veggies back to the eggs, because I want them mixed together. Then serve it up. Seriously that’s how freaking easy this Veggie Scrambled Eggs is. You can serve it with or over toast or English muffins, but lately I’ve devoured it on its own with some salt and pepper and lots of hot sauce. It hits the spot EVERY time! Tons of flavors from minimal ingredients. Use the veggies you have and enjoy. Add hot sauce or don’t, it’ll still be great! Fresh herbs take it to another level, and I’m partial to the basil. I’m betting that this Veggie Scrambled Eggs recipe will soon become your go-to breakfast too. 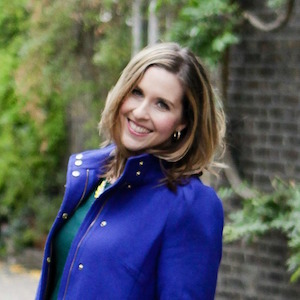 I can’t wait for you to try it out, so click that link for the step by step photos! Happy breakfasting! 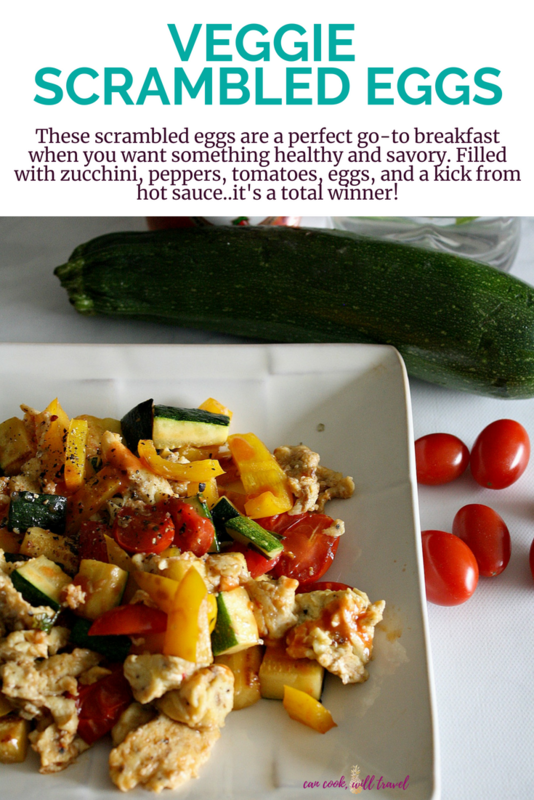 This is one of my go-to recipes year round, because you can throw whatever veggies you want in with your eggs. Then top with some hot sauce and fresh herbs and you've elevated your eggs with this healthy breakfast! 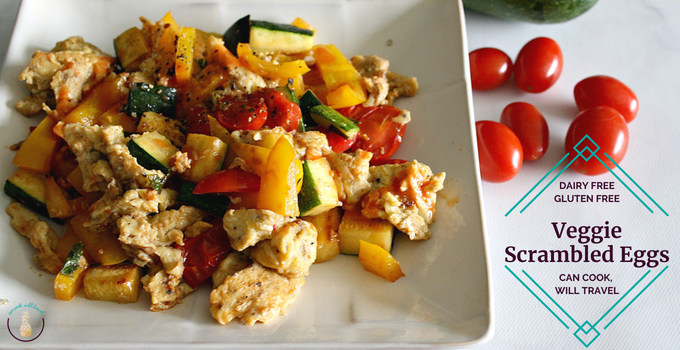 Heat a medium-sized skillet over medium heat with 1 teaspoon of avocado oil, or your favorite cooking oil. While the pan heats, dice up your zucchini and pepper into bite-sized pieces. Then add the veggies to the hot skillet stirring every couple of minutes. While the veggies cook, slice the grape tomatoes. Then add the tomatoes and basil to the veggies after the zucchini has started to brown a bit. Next whisk together the egg and salt and pepper to taste. Once the veggies are cooked, transfer them to a separate dish. Then remove the pan from the heat, add another teaspoon of oil, and our the eggs into the oil. Let the hot pan start to cook the eggs, then return it to the pan with a low heat and finish cooking until they’re cooked through. Add the veggies back to the pan and toss to combine. Then serve the meal right away topped with freshly cracked pepper, sea salt, and hot sauce and enjoy! Four years ago: Gooseberry and Blueberry Mini Tarts…When in Doubt…Bake! Six years ago: Egg Roll: To Bake or Not to Bake…Not Even a Question!